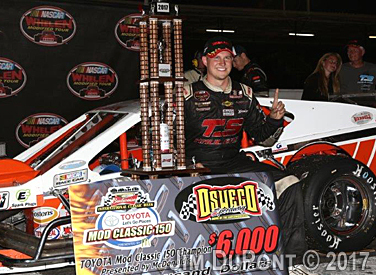 A spectacular summer for Ryan Preece continued Saturday night at Oswego Speedway in the Toyota Mod Classic 150 presented by McDonald’s. The Berlin, Connecticut, native took his fifth checkered flag of the season. Preece took the lead from Matt Hirschman on Lap 114 and never looked back. The victory was the 20th of Preece’s Whelen Modified Tour career and the first at Oswego. Preece ran up front all race long. After qualifying fourth, Preece quickly made his way up to second. On Lap 114, Preece dove underneath Hirschman in turn three. After taking the lead, Preece pulled away, with no one able to challenge the 25-year-old. Preece took the checkers 2.849 seconds ahead of Hirschman. Earlier in the day, Hirschman won his second straight Coors Light Pole Award and went to lead a race-high 117 laps. Preece also extended his point lead to nine over Doug Coby. Rowan Pennink is third, 16 points behind Preece and one ahead of Timmy Solomito. Justin Bonsignore was sixth at Oswego and is six points behind Solomito. Craig Lutz, Max Zachem, Dave Sapienza and Pennink rounded out the top 10 at Oswego. The Toyota Mod Classic 150 will air on NBCSN Thursday, Sept. 7 at 6 p.m. The NASCAR Whelen Modified Tour returns to the track Saturday, Sept. 16, at Riverhead Raceway in New York. Saturday At Oswego Speedway, Oswego, N.Y.
1. (4) Ryan Preece, Berlin, Conn., Chevrolet, 150 laps, 95.935 mph. 2. (1) Matt Hirschman, Northampton, PA, Chevrolet, 150. 3. (3) Timmy Solomito, Islip, N.Y., Ford, 150. 4. (5) Doug Coby, Milford, Conn., Chevrolet, 150. 5. (12) Eric Goodale, Riverhead, N.Y., Chevrolet, 150. 6. (7) Justin Bonsignore, Holtsville, NY, Chevrolet, 150. 7. (8) Craig Lutz, Miller Place, N.Y., Chevrolet, 150. 8. (15) Max Zachem, Preston, Conn., Chevrolet, 150. 9. (9) Dave Sapienza, Riverhead, N.Y., Chevrolet, 150. 10. (6) Rowan Pennink, Huntingdon Valley, Pa., Chevrolet, 150. 11. (10) Rob Summers, Manchester, CT, Chevrolet, 150. 12. (13) Matt Swanson, Acton, Mass., Ford, 150. 13. (16) Ronnie Williams, Ellington, Conn., Chevrolet, 149. 14. (14) Gary Putnam, Vernon, Conn., Chevrolet, 148. 15. (18) Calvin Carroll, Newton, N.J., Chevrolet, 146. 16. (20) Wade Cole, Hartland, Conn., Ford, 141. 17. (17) Ted Christopher, Plainville, Conn., Chevrolet, 107, accident. 18. (2) Patrick Emerling, Orchard Park, NY, Chevrolet, 86, handling. 19. (21) Walter Sutcliffe Jr., East Haven, Conn., Chevrolet, 57, clutch. 20. (11) Kyle Ebersole, Hummelstown, PA., Chevrolet, 38, electrical. 21. (19) Melissa Fifield, Wakefield, N.H., Chevrolet, 33, engine. Lead Changes: 1 among 2 drivers. Lap Leaders: M. Hirschman 1-117; R. Preece 118-150. 6. E. Goodale, 418; 7. D. Sapienza, 387; 8. M. Swanson, 380; 9. M. Zachem, 373; 10. R. Summers, 360..